K. K. Antony was born at Welayanaad, near Irinjaalakkuda, in the Thrissur district of Kerala, as the sixth child of Kunjuwareeth (Malayalam, “Little George”) and Mariyam (Aramaic form of Mary). He was a member of the Syro-Malabar Church, one of the eight Syriac churches among the St. Thomas Christians. As a child he grew up listening to the Syriac liturgical chants in the Chaldean (East Syriac) tradition. He also received preliminary lessons in Karnatic music from his older brother Kunjuwarky (Malayalam, “Little George”). At the age of nineteen, Antony migrated to Sri Lanka (Ceylon, at that time) in search of a better life. There he continued his studies in music under such famous musicians as A. R. Krishnan Bhaagawathar. After touring with a Tamil drama troupe for some time, Antony Master took the job of music instructor at Saiva Mangayar Thilakam Music Academy. For about twenty years from 1945, Antony Master gave Karnatic classical music concerts frequently on Sri Lanka radio. During that period, he also composed background music for a few films. From 1965 to 1969, he lived in Malaysia and worked as music teacher and television program organizer. In 1969, Antony Master returned to Kerala. In the same year he met Fr. 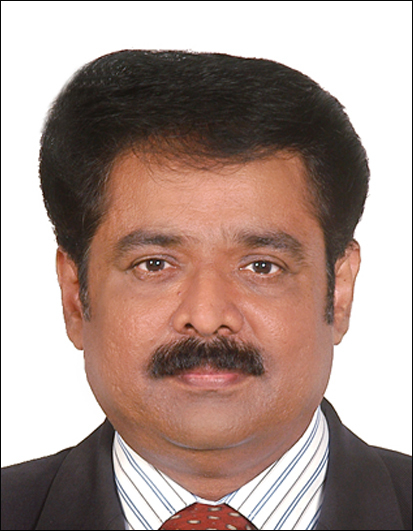 Abel Periyappuram, C. M. I. (1920-2001) at the Prior General’s House of the Carmelites of Mary Immaculate (C. M. I. ), at Eranakulam. The meeting of two great minds changed not only their own lives, but also the history of Christian music in India. 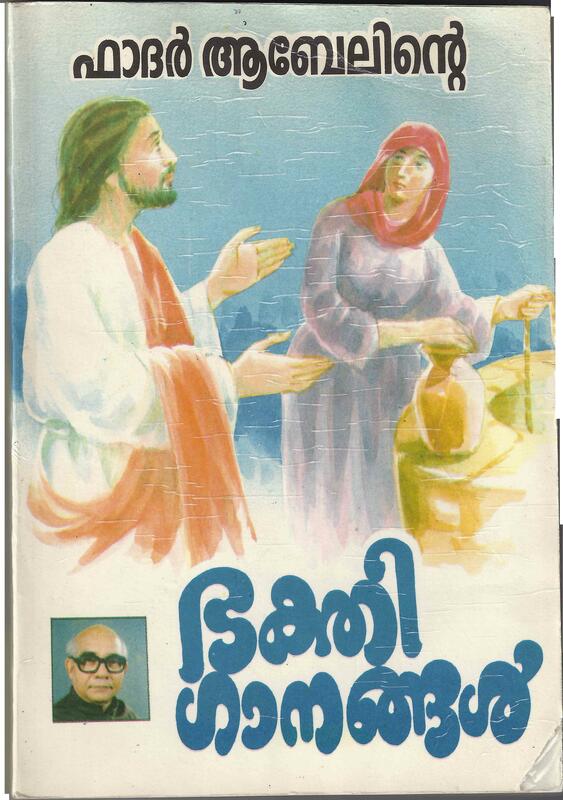 The two, along with Padmashri K. J. Yesudas (then an upcoming playback singer for Malayalam films) started the Christian Arts Club to promote Christian music. Soon, with the support of Joseph Cardinal Parecattil (1912-1987) and the Archdiocese of Eranakulam, the Club was registered with a secular name, Kalabhavan. For many years, promotion of Christian music continued to be one of the main activities of Kalabhavan, and Antony Master gave unreservedly his life and his talents for the cause. 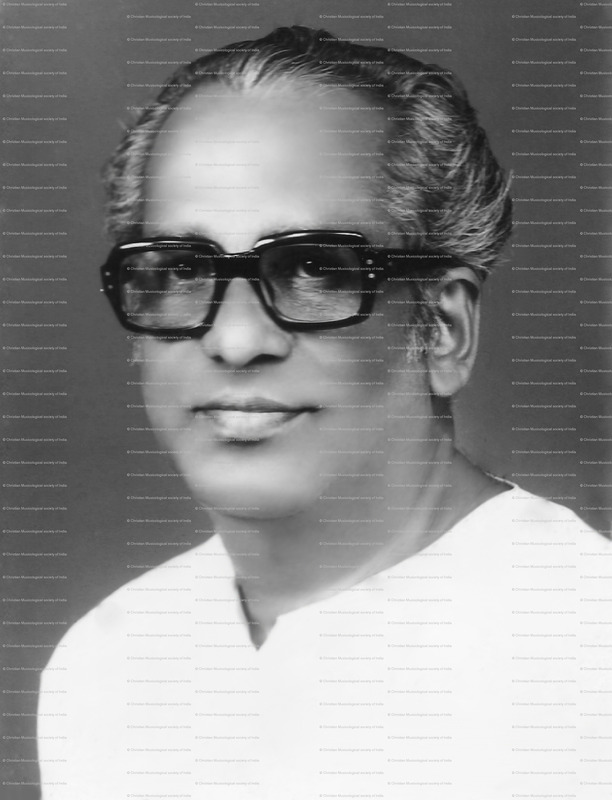 He remained teacher and music director of Kalabhavan until his death. In physical appearance, Antony Master was over six feet tall and had a commanding presence. He was always dressed in white with a simple cotton dhoti and a long collarless shirt (referred to by a Persian word, jubba). In contrast to his polite and genteel personality, Antony Master possessed a powerful baritone voice, resonant and authoritative (one of my regrets is that, in spite of our close association, I did not document his speech voice for posterity). Antony Master died suddenly of heart failure on a hot summer day on 16 March 1987, and was buried at the cemetery of his native parish, St. Mary’s Church. 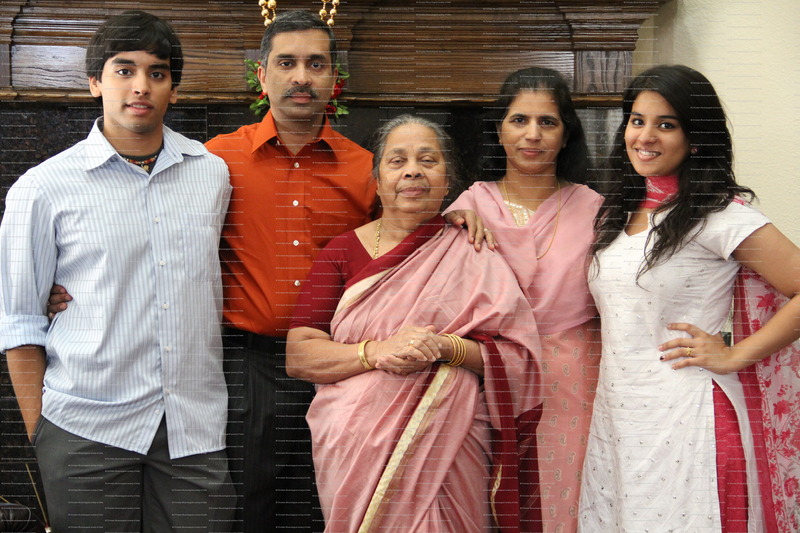 Antony Master is survived by his wife Rosey, their two daughters Lilly and Lissy, and son Varghese Antony. The tomb. The Maestro's name is rendered in Malayalam as "Kaanamkudam Kunjuwareeth Anthoni Bhaagawathar." Photo courtesy: Fr. Benny Arimbully. Antony Master’s childhood exposure to the Syriac melodies of the Syro-Malabar Church became an asset in his later years when he composed music for the two forms of Raaza (Syriac; literally, “mystery;” the most solemn form of Mass in the Chaldean rite) for the living (Uyirawarute raaza) and for the dead (Marichawarute raaza) and the sung Mass for the Dead (Marichawarute paattuqurbaana). Fr. Abel’s texts and Antony Master’s melodies for these masses were in use only for a few years. Yet, some of those melodies, albeit being simple and strophic, are a testimony to the creative genius of a great composer in adapting the Syriac mode (understood here as a combination of such factors as scale, melodic gesture, and vocal inflection) to the nuanced sound and syntax of the Malayalam text. Antony Master did not receive due recognition while he was alive. The only award that came to him was the Chavara Award, given by the Chavara Cultural Center at Eranakulam, in 1982. Neither the Kerala Church (that includes the Syro-Malabar Church that he served most) nor the Kerala Government officially acknowledged Antony Master’s contributions. They failed to see the man behind the music, the giant hidden inside the simple white garb of meek and humble demeanor. With that in mind, I suggested the idea of organizing a public function under the auspices of Kalabhavan to honor his memory and to raise funds for his family. Fr. 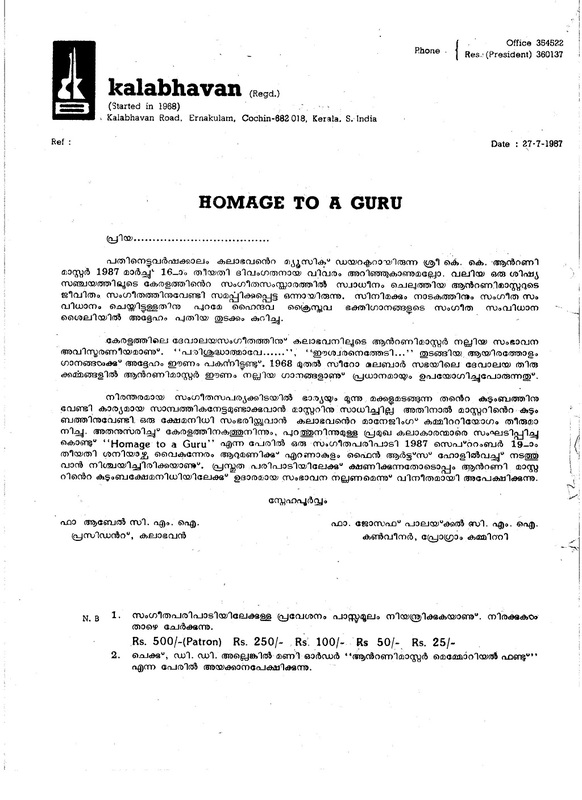 Abel agreed to the title of the program that I proposed: Homage to a Guru (Antony Master was my guru, too, and in 1986 we became colleagues when I started my service at Kalabhavan as Dean of Studies). The plan was to bring together all the students and artistes associated with Kalabhavan and Antony Master, including Shri K. J. Yesudas. I went personally to Tharangini Studio at Thiruvallom to extend the invitation to Shri Yesudas to attend the program and to make a contribution to the fund. Shri Yesudas was not in town. I met the Secretary of the Studio who, if I remember correctly, was the son of Mr. Satyan, the famous film actor. The visit turned out to be unproductive. 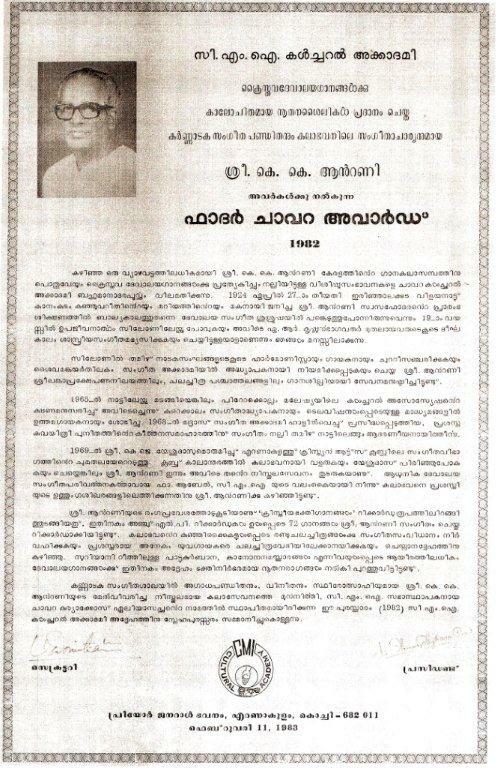 The program was conducted at Fine Arts Hall at Eranakulam, on 19 September 1987. The evening started with speeches by several civic and church leaders. Rev. Fr. Jacob Arenat spoke on behalf of the Archdiocese of Eranakulam, the foremost supporter of Kalabhavan especially in its formative years. This was followed by the performance of selections from Antony Master’s compositions by his students accompanied by Kalabhavan orchestra, and performance by Kalabhavan Mimicry troupe led by Jayaram who is now a well-known film actor. I served as the master of ceremony for the evening. Jolly Abraham came from Madras to pay homage to his teacher and mentor. The Ganamela started with his singing the most famous song of Antony Master, Parisudhaatmaawe neeyezhunnalli waranameyente hrudayathil (“O Holy Spirit, please descend into my heart”). The auditorium was packed to capacity. We were not successful in collecting a substantial fund for the family, but the program turned out to be a memorable event for everyone who attended. 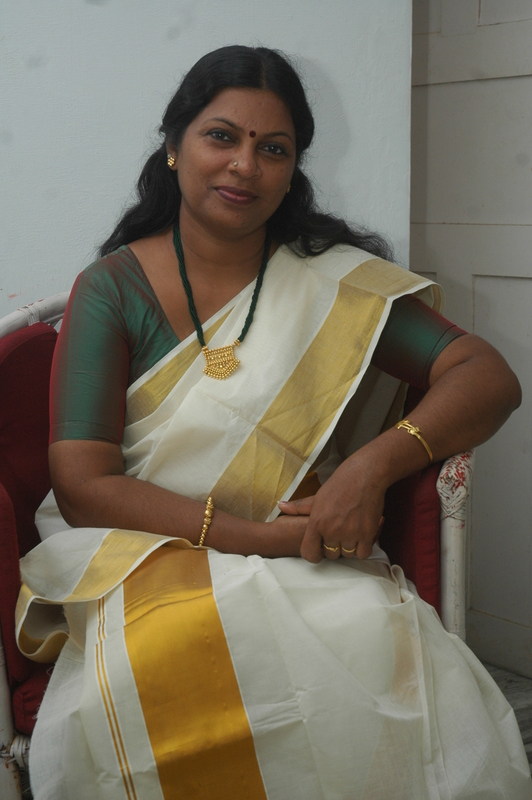 Noted playback singer Jency Antony recalls her memories of Antony Master. Deepika Book House, Kottayam (1997). Pp. 305. Includes the lyrics of 398 songs (this is not a complete list of Fr. Abel's works). Antony Master composed a large number of songs in this list. Fr. Abel dedicated the book (p. 5) to the two most important individuals in his professional life: Joseph Cardinal Parecattil and K. K. Antony Master. The 25th death anniversary of the Maestro was celebrated with great solemnity at his native parish, St. Mary's Church, at Welayanad, on Saturday, 21 July 2012. The celebrations were organized under the combined auspices of the Christian Musicological Society of India, St. Mary's Church, Kalabhavan, and Chethana Music College (see brochure). Antony Master's wife and children, including his son, Varghese who lives in USA, participated in the celebrations. Fr. Benny Arimbully, Vicar, along with his Parish Council members and parishioners worked hard to make the event a memorable one. His Eminence Cardinal George Alenchery, the Head of the Syro-Malabar Church, greeted the public gathering through a recorded message. 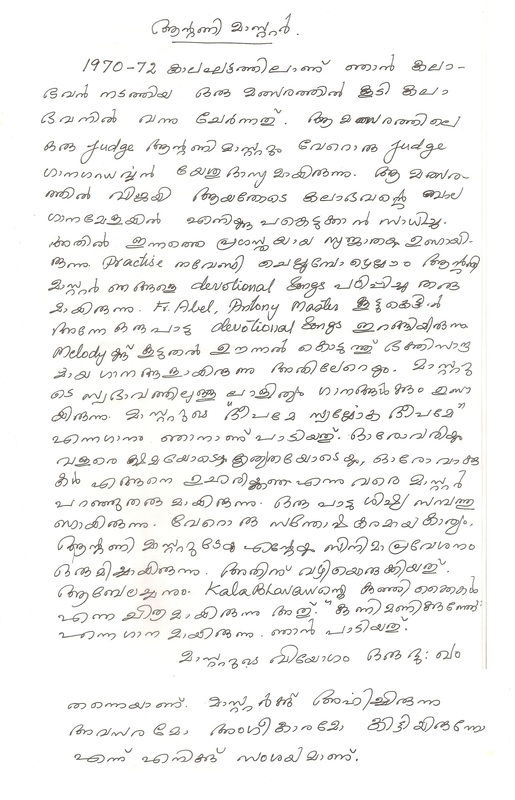 Padmashri K. J. Yesudas sent a recorded message recalling his association with the Maestro. Fr. Benny Arimbully prepared a short documentary film on the Maestro that was screened during the public meeting. Fr.Joseph Palackal paid his tributes by singing the song Neram Mangi Mayangunnu. The Sunday edition of Deepika dated 15 July 2012 featured an article on Antony Master. (In progress). Over the years at Kalabhavan, Antony Master trained a large number of students. He was mentor and voice teacher to many talented youngsters who later took music as their profession. In 1973, I took lessons from him in Karnatic music. At that time, Antony Master was composing music for the second edition of the Solemn High Mass of the Syro-Malabar Church, in Malayalam. He convinced Fr. Abel to include me among the singers for the recording (on to a spool tape). Antony Master taught me first his melody for Fr. 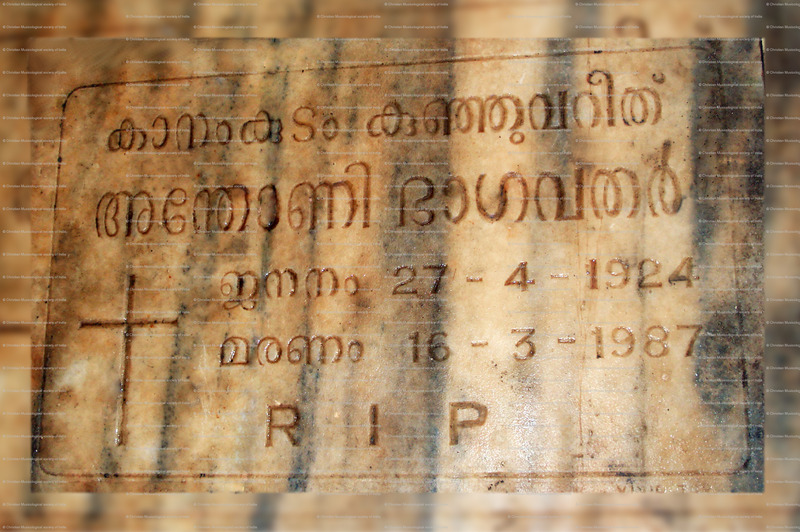 Abel’s text: Winnil ninnu samaagathamaayoru daiwakumaaranitha (“Here is the Son of God who came down from heaven”). As every aspiring singer in those days, I imitated the amplified voice of the popular male playback singers, and sang from my throat by adding an artificial bass to my natural tone, thinking that it would impress the Master. It did not. Antony Master diagnosed the problem immediately and asked me to say the words a few times and then said: parayunnathupole paatuka (“sing the words the way you speak”). It took a few sessions for me to translate that instruction into reality. But it turned out to be one of the most valuable lessons I ever had in my musical career. Today, when preparing the soloists among American children’s choir in New York, I often repeat Antony Master’s instruction. Whoever thought the Master’s words would resound in another language and in another part of the world, far away from Eranakulam! It was towards the end of 1977 that I became Antony Master’s student and disciple. Ever since, he has been my guru. The knowledge he imparted, the lessons he taught and the experiences he made possible to encounter, all stay as unforgettable milestones in my memory. In those days my residence was at Alappuzha. From there I used to travel every week to Eranakulam for musical classes under Antony Master. I had picked up the rudiments of Karnatic music from my mother in early childhood, and later learned under Charamangalam Antony for three years. It was much later that I got the good fortune to become a disciple of Antony Master. Unusual bonding: I was entering a world of musical depths unknown to me until then. Our bonding grew far stronger than seen between a lackadaisical disciple and an ordinary teacher. Antony Master exercised all his perspicacity and patience to instill in me the nuances of classical music. Our relationship was one of father-son rather than teacher-student. In those days I had written three lyrics and composed music for First Holy Communion service at my parish church. I presented those songs before Antony Master. One song, Bhaagyawaan, was composed in Hamsanandi raga. After listening to it attentively, Master approached and placed his palms on my head in a gesture of blessing, and said: “You’ll become famous as a musician. Your compositions touch a chord close to people’s hearts. May God abundantly bless you!” The next three years saw me face rigorous training under Master’s expert guidance. Marking milestones: In 1980, I was getting ready to record the album, "Abba Pithaawe" at a recording room temporarily arranged at the Mundakayam church. I very much wished to receive Master’s blessing before starting the recording. It was released by Fr Abel, C. M. I. by presenting the first copy to Antony Master. This album marked the start of several others of a similar strain that kept me preoccupied for the following years. In 1982, I was entrusted with the responsibility to provide music for the National Charismatic Convention held at Thevara, Kochi. The songs were recorded at the Sriragam Studio (present-day Aalap Studio) at Eranakulam. By sheer chance, Master visited the Studio at that time. On learning that the recording was of my songs, he walked into the studio; he listened to each song as it was being recorded, and stayed on late into the evening. Before leaving, he commented: “I feel exhilarated. These are excellent compositions. No doubt, they’ll become hits.” His words proved prophetic, indeed! The musical ministry at the three-day Convention which was attended by over 30,000 participants, turned out to be an unforgettable experience. After that, whenever I visited Eranakulam, I made it a point to visit Kala Bhavan. Antony Master was always eager and pleased to meet me. My association with Master took me to new arenas of the musical world. It opened my eyes to a new realization of the wide variety of musical strains that differentiate ever so slightly and is mostly unnoticed by the uninitiated. Master showed me how therapeutic music can be; its right use can nurture humanism and humility; music helps mature one’s mental faculties and develops a meditative strain. A philosophy of life that has a musical background can anchor one’s life in the right moorings. The knowledge that Master handed on to me has not only enriched my insights but also provided me with novel perceptions on the conundrum of life. Fr. Abel Periyappuram, C. M. I. : Father aabelinte bhakthi gaanangal The Devotional Songs of Fr. Abel.